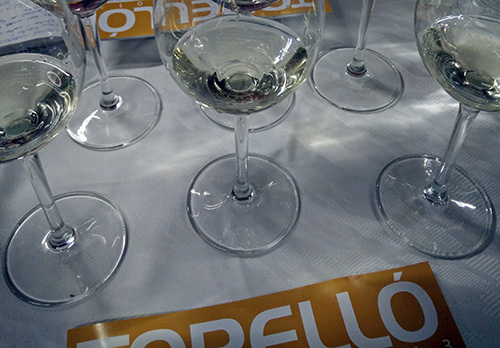 The Girona chapter of the Catalan Sommelier Association was gracious enough to invite me to attend one of their vertical tastings of a Cava and a red from the cellar Torelló in DO Penedès last week. While in general I don’t drink much from Penedès as I don’t really know what they’re trying to do well there other than light, approachable, and affordable white wines alongside the Cava production, I was happy to attend to hopefully broaden my mind as one must always do when it comes to wine. Aromas of brioche, apricot, lime peel, and vanilla cream with an overall citric angle to it in the nose. Light and fresh in the body. Nothing to write home about, but at the same time, quite pleasing and expressive for its age. Much more balanced aromatically with shortcake, apricot, white peach, and lemon peel. On the palate, it’s more nuanced with medium plus acidity that leads in to a tart finish. Could stand up much better with foie and other appetizer pairings with a fatty base. More elegance with orange blossom, lime peel, and graphite aromas as well as curious raspberry/strawberry notes that would allude to an unmentioned blanc de noir addition. The body is much more forceful and present with a solid acidity that stands up and wouldn’t back down from a plate of shellfish or even game birds. Bubbles done, we moved on to the Raimonda Reserva which appears to be their flagship red and is primarily comprised of Cabernet Sauvignon with a bit of Merlot, Tempranillo, and Grenache depending on the year. It’s important to back up a little bit before talking about this wine as it’s always hard for me to get past Cabernet Sauvignon in warm climate vineyards. There’s a reason it’s one of the main workhorses in Bordeaux in that it’s an Atlantic and much more northerly zone. Cab Sauv seems very happy there although given that it’s a pretty resilient grape to cultivate, we find it everywhere and frankly to me it either doesn’t work or is quite boring. Many winemakers I know have some of it. They like it because they say it gives a bit of backbone to their wines and fills them out a bit. To me it seems a lot like sawdust in sausages in that it can increase your production levels without taking away that much character from the final wine. Ultimately that’s fine as making wine isn’t the best way in the world to keep food on the table, but the real problem is when you make it the star of the show and it then seems to get a little stage fright. Even with giving it a good supporting local cast, it doesn’t really seem like it’s all that comfortable. And this is what you see with the Raimonda Reserva in that it seems to be a wine made to emulate the Bordeaux (down to the use of barrels from Limousin) with a touch of Tempranillo or Grenache thrown in to Spanify it a bit. There’s nothing wrong with the wine, but at the same time it doesn’t really excite me. If you happen to really like Cab Sauv and want a bottle for around 14€ then there’s nothing about the Raimonda Reserva that would turn your off. I still stand by the fact that this grape shouldn’t be cultivated anywhere south of Toulouse and that if using it as part of a blend in Spain, even in more temperate regions like Priorat, it should be minimal. Lively purple in color with light bellpepper, ash, prune, dark cherry, fennel, and strong mineral aromas with a very tight body holding high tannins. A more moderate ruby color with aromas of cured cherry syrup, dark plum, smokiness. Toasted American oak notes are quite prevalent, and it has a medium body and finish. This bottle was reduced and shouldn’t have been served as it was both weak in the nose and body with only minor raspberry notes to account for and unbridled as well as un-integrated alcohol. Showing a mature garnet coloration with dark cherry, cloves, and graphite aromas with a medium body and medium plus acidity which presented a more rounded and properly mature wine. Stronger bell pepper notes with stone fruits, prune, tobacco leaves, sage, and fennel. The body holds medium strength but is starting to taper off and should be drank now.